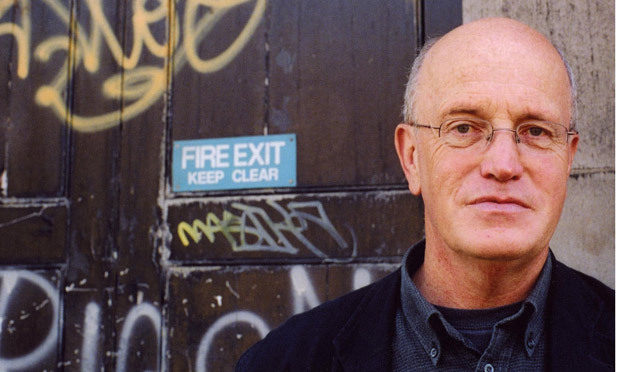 Few writers trawl their territory the way Iain Sinclair has London—footsore and picking over secret histories, missed encounters, and enigmatic detritus all the way out to the 125-mile ring of the London Orbital. 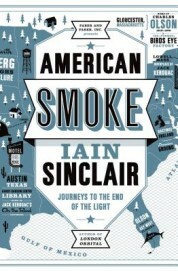 From the occult forensics of his 1970s poems to 2012’s Ghost Milk, his dissident swansong for a city succumbing to the grand projects of a swindling elite, Sinclair picks up the poetic debris and marginal characters sloughed off by England’s capital as it is streamlined to a pure boutique artifact. 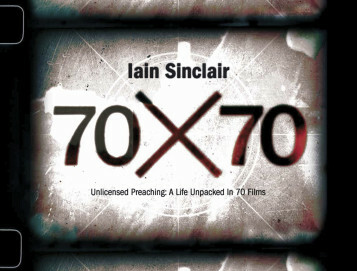 Sinclair first came to London in the early 1960s to study film, and the recent book 70x70 (Volcano Publishing) documents a 2013 series of screenings of seventy films, one for each of his seventy years. Not a best-of, these were films that had appeared in his books, each of which possessed “energy, attack, context—but which stood outside the usual registers of excellence.” He and his collaborators designed the series to encourage pilgrimages across London to vanishing venues as a way of reconfigure the city for those willing to take up the challenge. Following the 70x70 screenings, Sinclair and director Andrew Kötting filmed an eighty-mile walk in the footsteps of the romantic poet John Clare on his flight from incarceration in an insane asylum (the Kickstarter-funded film is soon to be released as By Our Selves). In his harrowing account, Clare sleeps in ditches, eats grass to stave off hunger, talks with ghosts, and remains convinced that on arriving home he’d find his early love Mary Joyce, by then several years dead. Sinclair wound this story together with events from his wife Anna’s childhood in his 2005 book Edge of the Orison: In the Traces of John Clare’s “Journey Out of Essex” (Penguin). In his most recent book, American Smoke (Faber & Faber, $27), Sinclair returned to the icons of his youth, tracking down the traces of beat writers on both coasts of North America. From Gloucester, Massachusetts—home to Charles Olson, who laid out Sinclair’s method of diving into the local to get to the universal—he moves across country and through time to William Burroughs in Lawrence, Kansas, and Malcolm Lowry sweating out Under the Volcano in his Dollarton, B.C. hideaway. Traumas pile up and careers come unglued, as he evokes an intense, lost era with little nostalgia. Sinclair spoke with me about these and other works in a recent phone interview from his home in Hackney in the east of London. Paul McRandle: I’ve been rereading Edge of the Orison and very much enjoying it. Does the film By Our Selves follow the same path in terms of mixing your life, your wife’s experiences, and John Clare’s? Iain Sinclair: The film is very different. I wanted to do a film of that book from way back; there was some filming done in the beginning and the end by Chris Petit, who’s a longtime collaborator, and also I took photographs of the journey. I had a fantasy of a sort of Werner Herzog-type film, like The Enigma of Kasper Hauser, but nothing ever happened until Andrew Kötting saw a photograph of the straw bear that’s in the book; he became very energized and the film evolved from there. So it’s like the book in the sense that it has numerous elements that work off the myth of the John Clare walk, which is central to the English imagination. It’s also rather like Bunyan’s Pilgrim’s Progress—this extraordinary epic journey across the English landscape. But the subsidiary elements are completely different, because Andrew works in a subtext story about his relationship with his daughter Eden, who becomes a sort of Dorothy figure from The Wizard of Oz. And the part of John Clare is played by Toby Jones, a well-known actor who’s virtually silent and who’s actually doing the walk, but is also played by Freddie Jones, his father, who played Clare in 1970 in one of the BBC Omnibus films. He’s all voice and the son is mute and physical—they haunt each other. So there’s things in the film that don’t have any part in the book, but it’s the same style, the same impressions, a collage bringing together all kinds of different strands. PM: I saw Toby Jones in the trailer and he looks terrific in the role. IS: Yeah, he’s great. The thing with Toby Jones is the detail. He absorbs the character; he doesn’t do anything except look and feel. The few times he spoke it was quite shocking because it was all internalized. Whereas his father is an actor in that full-on English tradition—you’ll hear his voice in the trailer doing bits from the original film. We’ve subsequently spent time with him and filmed and recorded him. He looks like King Lear. He’s really wonderful and very different from Toby in every way, but the two work extremely well together. Toby was four years old when his father played John Clare and his mother played Patty Clare, and so he was quite confused by this when he saw it as a young lad. It made a huge impression on him. I think he wanted to be involved with the project as a homage to his father, who’s now well into his eighties. Freddie actually appeared when we did a show in Oxford: he gave a reading of “I Am” and was tremendous, I must say. PM: Clare’s early poems have such gorgeous evocations of the environment and very specific images of bird life, plant life, and so on. And then you get to “Journey Out of Essex,” which is a strikingly desperate and sad prose piece. By contrast your book is lightened up by memories of your life with Anna and Anna’s recollections of her childhood, which are fascinating. IS: It’s using that original story, which is so short really, as a sort of spine, an inspiration, a way of tapping into memory and particularly into Anna’s relationship with that image and that area. And then those strange parallels: John Clare is from Helpston, which is a nearby village, but he went to the church school in Glinton, where Anna went to school. In fact, her family grave is now about ten yards away from Mary Joyce’s grave. So all of those things were quite uncanny. PM: Did you find that writing about your own life with Anna was more of a challenge? IS: I don’t know that you really write about your own life—you make a myth of your own life. You smooth over certain things. Again this goes back to people like Kerouac, a writer using more or less of the facts to articulate a larger structure. Sometimes it bends into extremely exaggerated versions, versions that have barely got any relation with life itself, and other times it seems to be almost a diary-like account. It hovers somewhere between the two. PM: And Edge of the Orison was written four years after the fact . . .
IS: Yes, unlike “Journey Out of Essex,” which was written straight after Clare had done the walk. It’s almost like an impassioned letter; if he didn’t write it the experience would be gone. And already it’s gone to some extent because he can’t quite remember the names of places or what happened, so his account is like this feverish dream. Whereas my Edge of the Orison is done in cold blood, as it were, sometime later. The diary form of the walk is kept at a distance, but it’s used and then the other forms of research that have gone in can take their place alongside it and put it in context. PM: Can you talk a little about the kinds of research you do—are you looking at receipts and maps and photographs? It seems like a collage. IS: Yes, that’s basically what it is. It’s like scavenging an accumulation of detritus around the project, picking up pamphlets and so on during the various journeys. But more, it’s about repeated excursions to a territory. It’s not as if I just did that one walk—I went back and different bits spun off the walk for a long period of time. I went round on the canal narrowboat journey, for example, with Brian Catling and Anna, and looked at the landscape from the water, which was another thing. So all that was research, but then there were books that had to be read and attempts to get into the libraries. Northampton Library was really very friendly and useful, and the main thing was to see the actual original manuscript of “Journey Out of Essex.” Peterborough Library was not very helpful; they were really reluctant to let me see things without endless papers and documentation. Then there was also subsidiary research into Anna’s family, which involved quite a lot of poking around documents, looking at gravestones, and all of those things. PM: You mention in Edge of the Orison that in Clare’s “Journey Out of Essex” manuscript the lines themselves were long enough to suggest walking. IS: Yes, it looked like a walked page, because paper was very precious to him. It was expensive, so he tends to write right to the very edge; sentences would explode across the page in enormous excitement and then there’d be black gaps and dashes. The physicality of the actual manuscript was like a living map. I felt it was like projective verse, or Kerouac’s spontaneous prose. There certainly wasn’t room for corrections and tidying things up; it was just a great gush. It was beautiful. It was like an action painting. It’s a tremendous manuscript. PM: Does By Our Selves continue the critique of grand projects? IS: No, not really. I think that the John Clare story is itself a critique in lots of ways. The Enclosure Act of 1809 totally changed that landscape and he was completely in thrall to the two great landlords of the area, Burghley House and Milton House—everything was owned by them or by Cambridge colleges. And that sense of oppression and enclosure was huge on him. And now of course it’s seeped into the Epping Forest landscape, down into the lower Lea Valley and London. So there are big parallels for me in that story and I touch on them in the book, but not really in the film because the film gains much more of its momentum from Andrew Kötting’s take, which has to do with performance, physicality, and sense of place, but not with those socio-political concerns that I see as coming off the Clare story. The film is a physical drama of moving the figure across the landscape and tapping into the folk roots of English song and the harshness of life at the time. That’s mainly what Andrew’s interests are and I think that’s what comes over in the film quite strongly. There are accidental clashes with what is going on in the landscape now in terms of implanted wind farms and so on, but there isn’t really a critique in the sense that I try to get into my own work. PM: In moving an object across territory, By Our Selves seems related to your 2012 paddle-boat film with Kötting, Swandown. IS: I think it’s actually moving an object through bifurcated memories; I’m both revisiting the book and revisiting a central journey, because the idea of doing the John Clare walk came from walking around London and thinking, “How do you get out of it?” This circle goes on forever. And suddenly the idea of this escape walk of Clare’s seemed to sit perfectly at the end of one project and lead into the next. So revisiting that in my own memory at the same time as Andrew is making it weird by imposing the figure of the bear, which becomes an avatar of depression and of the landscape . . . The bear emerges from the landscape and accompanies Clare on the journey and finally splits off away from him and goes into Kötting’s own mystique, whereas Clare just disappears into the gravity of the black hole of the Northampton Asylum, which in this film is slightly associated with the presence of Alan Moore, who is a keeper of the legends of Northampton. PM: Were there any landscapes you walked through for American Smoke that spoke to you in the way that this walk has? IS: Yes, the landscape of Gloucester, Mass. The presence and the strength of those few traces of Charles Olson were probably the most significant. That’s partly why I opened the book with that. It was the freshest thing in mind because it came right off the back of doing the Swandown project, where we’d been pedaling this plastic swan through the rivers of England. Coming into America to a fishing port in Massachusetts, it was looking pretty depressed; the economic plight was there and the people seemed to take warmth and strength from remembering Charles Olson. There were very definite connections between these projects and that place powerfully registered in my mind even though I’d never been there, but I’d thought so much about it and read so much in the Maximus poems and his letters. This was certainly a gripping place and the area of Dogtown was especially haunted—the glacial moraines, the rocks. That was the primary landscape. My sense of the Pacific Coast was much more about movement, as we weren’t really in one particular place long enough to register; we were just moving through. Obviously Gary Snyder in the Sierra Nevada made a very big impression, but it was only a few hours and very fleeting. So it didn’t grip me in the same way that any of the landscapes I’m talking about in England do. PM: Are there places you intend to return to in America? IS: I wouldn’t imagine returning to many of the places in that book. Obviously I would like to return to Gloucester; I would return happily to San Francisco, I guess. But I’m more interested in Mexico. It’s drier and more arid. I’ve got feelers that I’ve been pursuing, but whether that will happen, I don’t know. The economics of it are quite tricky. PM: The section on Roberto Bolaño in American Smoke is fascinating. IS: Yes, I’ve enjoyed his work very much and he’s a sort of absolute presence, if I can say that. His footsteps seem to be just in the next room all the time, hauntingly so. I’m quite interested in further connections there. I seem to be making some kind of relations now in Spain and Chile and places like that, so who knows? PM: When it came to pulling together the 70x70 film series, how did the “anti-pantheon”of film come about? IS: It was two things really. Because the films were being done specifically, as it were, for my seventieth birthday, what I could use most functionally as markers were books that I’d written. I’ve always referenced film quite a lot in whatever I write, so I tweaked out film titles from the various books until I had a long list, and used that as the basis for this structure—rather than thinking about film on its own, or best films or worst films, or anything else. So essentially it’s a form of autobiography through memory of cinema. I then added in a number of films I’d been logging as projects, so that brought it even further into the form of refracted autobiography. The anti-pantheon business came from a series of conversations with Chris Petit, because we’d made four films for Channel Four in an earlier period and tried to put forward lots of others since that time. One of the things that he got very interested in was an anti-pantheon—films that were well worth holding in memory and for discussion but which had no place in the established pantheons of cinema. They were never going to be listed as great films or bad films, but they were films that seemed to have a quality that was essentially cinematic, that couldn’t exist in other form. It’s hard to define exactly, but we batted certain titles backwards and forwards and agreed on a list for an anti-pantheon. I guess some of the ones in my seventy films would fit with that and others wouldn’t; this is much more my personal list of films that have accidentally been a part of books that I’ve written. PM: I was struck that Antonioni’s Il Grido went without an audience. IS: I know, that was very depressing. I’d been looking at Il Grido when I was writing American Smoke, because of the whole section on Italian cinema. And I just had to look at it again and I thought how strong it was, and how interesting to try and position it in England, so this very hip pizza place agreed to show it in its cinema upstairs. And nobody subscribed to it, so they cancelled the show, which I thought was pretty sad. That said something about the whole process. I’ve done a diary piece for the London Review of Books, sort of summing up, and mentioning that. That was one of the weirder moments. PM: They seemed to be in such well-chosen venues, too. IS: Well, that wasn’t down to me, but I thought at least some of them were extraordinarily well-chosen. And it told the other part of the story, which was to do with trying to recapture something that happened in earlier times, which was the adventure of actually getting to the place where the film was shown. You’d make a journey and you’d see this strange film that you may not see again for years, because there were no DVDs. There were no ways of tapping into these things—you either found it being screened or you didn’t, and to do it made you journey all over London. I wanted to get back to that. PM: Finding your way to a theater is something closer to the dream state than sitting in your bed, staring at a laptop screen. IS: Yeah—there’s the journey, there’s the architecture of the building itself, there are strange people gathered around you to see it. It’s a whole, real world, social experience, whereas the other thing is entirely in the head. PM: Did you find yourself reassessing the films you made with Chris Petit—The Cardinal and the Corpse, The Falconer, Asylum, and London Orbital—when they were shown in the series? IS: I think we did, to some extent, because I haven’t looked at them in some time. And they looked different in various ways. The Cardinal and the Corpse, being the first one and the only one made with an orthodox crew, was mainly interesting just for the sheer amount of stuff that was squeezed into a small space. So many characters who were part of a London of what I call “reforgotten” writers, interesting writers who disappeared from the canon and then returned again. And also the book scouts and runners of the used book trade, people who’d been in that world. It was an astonishing kind of party in a sense, gathering all these people together in that moment. Quite a number of them are dead now and you could never do that again, so it was interesting in that respect more than as a film. Whereas I thought The Falconer was a nice sort of paranoid portrait, using document and fiction and myth and the archive, with a slight, unusual sense of what was happening in the city, too—how London was getting to be filled with cameras all watching you all the time. I thought Asylum probably looked the best of the films; it was the most realized as a film. But of course it had the subtitle “The Final Commission” and it pretty much was. I know London Orbital came after that, but that was an exactly parallel extension of the book being written at the time. And then that really was it, which is slightly a matter of regret. But it was interesting to dust those things down and take a look at them again, because they’re not readily available. PM: The character Peter Whitehead in The Falconer is a compelling figure, but he’s somebody I could easily understand wanting to distance yourself from. IS: He was a kind of monster in a way, but interesting. Initially he wanted this thing to be about him—he’s very narcissistic—and he’d keep producing more and more evidence of a life that was largely in film. There were numerous strange scraps of film about him or things he’d done. The film essentially was not about Peter Whitehead, but it became about him, and then of course it became a kind of psychological breakdown around him. And then it got too close and he repudiated it and didn’t want anything to do with it. The further we got, the more sinister he seemed to become. He was quite keen to step away from that. PM: I noticed that during the 70x70 series you showed a “remix” of London Orbital. Was that out of a sense of dissatisfaction or an effort to try something new? IS: London Orbital was shown at the Barbican and we did it with a live reading. We just showed a bit of the film and read live to it, which was, I suppose, to try to get into the mode of how things would get done now. There wouldn’t be the possibility of being commissioned to make the larger scale films, but there’s no reason why some kind of image retrievals would not be presented as live, one-off performances in which you deliver the text rather than encode it into a strip of film. It would be much more like a tent show—do it and move on for next to nothing. So looking at London Orbital now was a way of testing out that possible ground for the future. PM: As a road movie it’s really quite hypnotic. IS: Well, it’s endless. It feels like it’s just this infinite loop, it could go on and on in almost any order. PM: It was also interesting to see Brian Catling’s fantastic novel The Vorrh turn up in 70x70. IS: That’s a pretty amazing story. That book, it was impossible to get anybody to even look at it. Then Alan Moore wrote a forward that was hugely encouraging and in minutes people offered to publish it. Now it’s even got a big American publisher. I think they certainly will bring him over to promote it. PM: Your work can’t be read without encountering the work of other writers, other filmmakers, painters, and so on, opening up the pleasure of new discoveries. And that seems to have been your technique from almost the very start. IS: Yeah, I guess so. I think it’s a standard, old modernist technique, isn’t it? You’re full of echoes of other writers; everything is assembled from that starting point. The relation with other writers becomes a sort of detective story, picking influences and suggesting that books lead into other books lead into other books infinitely. PM: A while back you gave your archive to the Harry Ransom Center in Austin, Texas . . .
IS: Well, I didn’t give it, I sold it! It was kind of a life-saving thing. It wasn’t huge Ian McEwan-type money, but it was something. All my early stuff is down there now. I don’t think it’s all been sorted yet. It probably was a huge task to do so, but it was quite a useful exercise for me and I did go over there and look at some things and gave a few talks at university. PM: And you didn’t feel that you had excavated part of your life and sealed it off? IS: I felt a relief to make a little bit of space by that stuff going out, but I was slightly uneasy about the fact of it finishing up in Austin, Texas. The people who come and talk to me about things and want to look into various aspects of what I’ve done are really here in England. And if there had been somewhere convenient to do it here, it would have probably felt more right. But on the other hand, it’s so bizarre and exotic to have it there that I do find it interesting. PM: It seems that the occult themes that appeared in books such as Lud Heat and White Chappell, Scarlet Tracings have subsided a bit—the imagery of the ley lines and so on haven’t been as apparent. IS: Lud Heat, Suicide Bridge, and White Chappell, Scarlet Tracings related to periods of my life when I was working as a gardener or whatever in that landscape, so relatively I was disempowered. I had no voice in the way things were. I was quite interested in strange systems of belief and also in the Earth Mysteries, the ley lines and all of those things. This sat very nicely with how London was at that point. And then being a second-hand book dealer after that, I would be reading all kinds of obscure things, very weird and eccentric stuff, and that fed into what I was writing. But after the late ’80s, when I was writing more mainstream things, I guess the shift became that the political was then occulted—there was a sense that that was the power and it was a different thing. In a sense that discourse maybe had to be stepped down a bit, because it would have made things unreadable. Not that I’m trying to smooth things out to be popular, but I’m dealing with editors. And I’ve certainly not lost interest in those more abstruse areas. I’ve published through smaller presses, like Swedenborg House hereabouts, collaborations with Brian Catling. Those things are still there. PM: What are you working on now? IS: Well, one of the nice things about this place is that it’s old, it’s got all of these traces, and they’re infinitely provocative. I’m just about to start doing something along those lines with the Gower Coast in South Wales, which is a very ancient, carboniferous limestone with caves that have the oldest traces of Ice Age man and things, which is not a territory I’ve done anything about for years. But I grew up not too far away and am just starting to use that in a different way. So it’s really going back more into that kind of writing you mentioned before, the earlier Lud Heat era. Mind you, it won’t be the same but I’ll try and touch that spirit. This entry was posted in Uncategorized and tagged Spring 2015 on April 27, 2015 by Kelly.